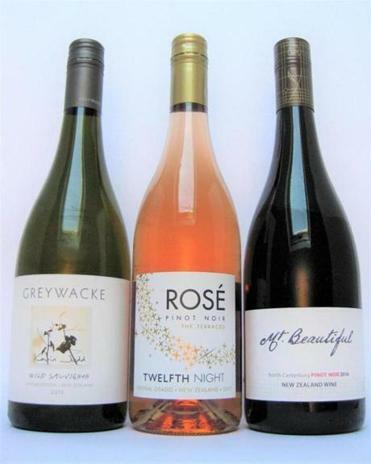 Leave it to a duo of Boston sommeliers to broaden notions about New Zealand wine. Greywacke “Wild Sauvignon” 2015 Kevin Judd, founding winemaker of megabrand Cloudy Bay, crafts wine under his own label. Using wild rather than commercial cultured yeast, this Marlborough-made pour offers white flowers and yellow fruits, leading to a multi-dimensional palate of citrus, stone fruit, and a smoky whisper of flint. Around $30. At Needham Center Fine Wines, Needham, 781-400-1769; Bacco’s Wine + Cheese, Boston, 617-574-1751. Twelfth Night “The Terraces” Pinot Noir Rosé 2017 Winemaker Antony Worch of Vela Wines crafts this gutsy rosé in Central Otago. Waterfall fresh on the nose with peach, lemon blossoms, and citrus rind, this tart, dry pink is generous with red fruits and a touch of saltiness. Around $19. The Cheese Shop of Concord, Concord, 978-369-5778; Pemberton Farms, Cambridge, 617-491-2244. Mt. Beautiful Pinot Noir 2016 Owner David Teece named his estate for the peak that protects vineyards from coastal winds of North Canterbury. This red is full of cherry-berry notes, an edge of appetizing bitterness, and subtle tannins. $25 to $30. At Boston Wine Exchange, Boston, 617-422-0100; Cambridge Wine & Spirits, Cambridge, 617-864-7171.